Astronomers Alyssa Goodman (Harvard-Smithsonian Center for Astrophysics) and Hector Arce (Caltech) announced today at the 203rd meeting of the American Astronomical Society that they have caught a newly formed star in the act of speeding. PV Ceph, located about 1400 light years away in the constellation Cepheus, is whizzing through space at a speed of 40,000 miles per hour -- some 40 times faster than a speeding bullet. And like a bullet, it left an exit wound when it ripped out of the star cluster where it formed. These findings linking a speeding star to its birthplace provide direct observational support of theoretical simulations predicting that protostars can be tossed out of a young cluster. 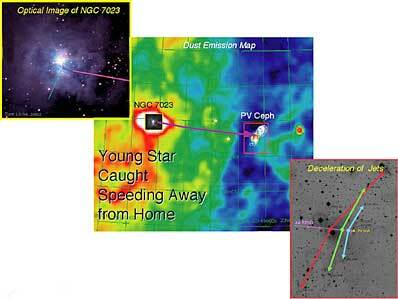 This is the first time that such a fast-moving young star has been seen outside of a cluster or binary system. "PV Ceph was exiled from its home, thrown out before it even finished forming. It crossed an ocean of empty space and now has found a new home in another molecular cloud," said Goodman. Their discovery has significant implications for calculations of star formation efficiency - how many stars of what sizes are likely to form from a given molecular cloud. Modeling that process correctly is critical to understanding how galaxies everywhere turn gas into stars. "Figuring out the story of PV Ceph was like conducting a CSI investigation. We had to piece together a jigsaw puzzle of clues to assemble a picture of what happened to this star," said Arce. The first clue came from examining the Herbig-Haro (HH) knots on either side of PV Ceph. Those blobs of shocked gas were ejected from the young star in opposite directions. The midpoint of the line connecting a pair of these blobs hints at where the star was located when it ejected that matter. Three lines can be drawn between three pairs of HH knots near PV Ceph. Each midpoint falls in a different location, marking the star's trail like breadcrumbs and providing clear evidence that the star is moving across the sky. More remarkably, the star's path points straight back to the young star cluster NGC 7023. In fact, it points to a dark rift in the nebulosity where a line of gas has been swept clear. "The chances of this alignment being random are literally astronomical," said Arce. Delving deeper, Goodman and Arce examined their recent radio observations of the dense interstellar gas near PV Ceph, and found that the star appears to be leaving behind a trail of molecular gas pointing in the same direction as that implied by the geometry of the HH knots. "That trail of gas was left behind like a wake from a ship," said Goodman. A fourth clue involves the tilt apparent in the high-velocity molecular jet now emanating from the star. That tilt again implies a speed of 40,000 miles per hour, completely independent of the other lines of evidence. Even the approximate 500,000-year age of PV Ceph matches the estimated time for it to travel the huge 30 light-year distance from NGC 7023 to its current location. "Clearly, the preponderance of evidence points to NGC 7023 as the origin of PV Ceph," concluded Goodman. Still unanswered is the question of what PV Ceph was doing, and what gas and/or disk it took along with it, in the time it was traveling through the empty space between NGC 7023 and its current home. Goodman and Arce's calculations show that the star may have been able to hold onto a surrounding cocoon of material as large as 200 astronomical units. (An astronomical unit is the average distance between the Earth and Sun.) A cocoon of that size would encompass our solar system out beyond Pluto to the Kuiper Belt. "It's not impossible that planets are forming around PV Ceph right now from that material," said Goodman. Also unanswered is what this finding implies for theories of star formation in molecular clouds. "How do you conduct a census of a star cluster's true population when some clusters are losing stars, some clusters are gaining stars, and some clusters are unchanged? If these ejections are at all common, then calculations of star formation efficiency become much more difficult," said Goodman. Goodman and Arce recommend a focused campaign to measure the velocities of young stars in search of other "speeders." Their study of PV Ceph will be published in an upcoming issue of The Astrophysical Journal.